It has been a couple of months now since we stepped up our efforts to reduce our household waste (more about our reasons for this in a forthcoming post) so I thought it was time to do a bit of an audit of what these changes would save from going to landfill or needing to be recycled over the course of a year, and also to see if we are saving any money along the way. 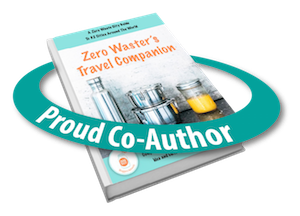 We had already been doing quite a few things to reduce our waste, but today I’ll just cover the new ones. 1. 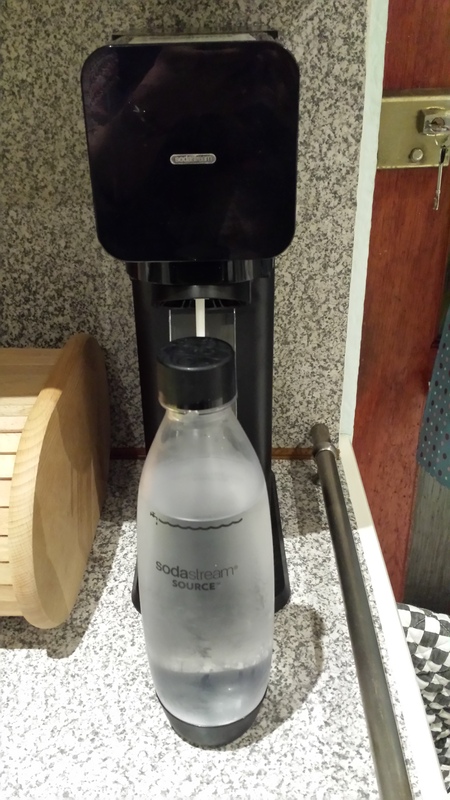 Replaced individual bottles of sparkling water with a Soda Stream. This comes with just 2 plastic bottles that can be reused for around 2 years (not sure what happens to them after that if you continue to reuse but they are labelled with a date). Based on an average of 10 x 50cl bottles per week this has already saved quite a few bottles. Over a year we will be sending 520 fewer plastic bottles to our recycling centre. With the Soda Stream costing us £40 and the gas refills costing £7.99 (enough to make 60l each), we will also save around £150 in the first year, more thereafter. 2. Swapped boxes of Lyons individual coffee bags for loose coffee roasted locally and ground straight into my own container. We were buying around 1 box of 18 bags most weeks as well as less frequent packs of ground coffee so will be saving around 50 cardboard boxes, plus 900 foil wrappers and paper bags, and around 6 foil ground coffee packs over the year. 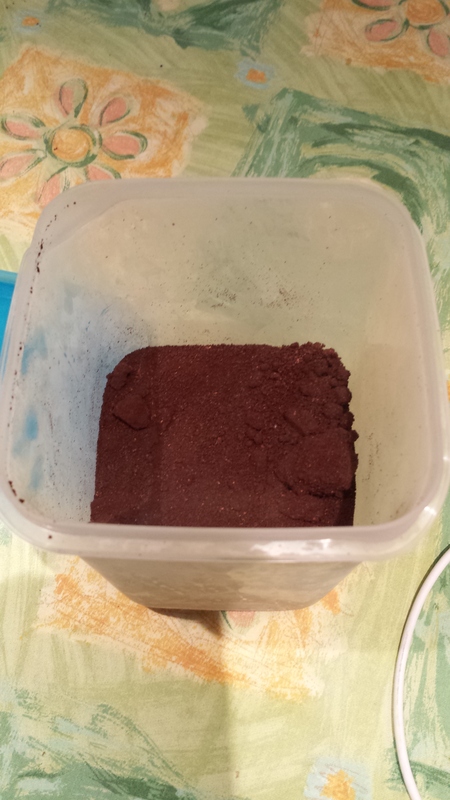 In terms of cost, the freshly ground coffee is more expensive than buying ready packed ground coffee but compared to the coffee bags we were buying there is probably around £1 per week saving – so approx £50. 3. Been making all of our own bread in a bread maker. We had been making it about once a week before and making it all saves approx 2 plastic bread bags per week – 100 over the year. More tricky to work out the cost here since we are eating more bread (as also being more determined to pack lunch each day) and the loaves aren’t the same size as the purchased ones so I have not assumed any saving. As far as possible this is put on during the day to use solar power. 4. Purchased re-useable coffee cups to use when we get takeaway coffee. Between us we use them for around 3 coffees per week – a saving of around 150 paper cups and plastic lids. No cost saving here. 5. Been reusing a bag to put fresh croissants in each week instead of putting them in a fresh one each week. This will save approx 50 paper bags with plastic windows. Cost neutral. 6. Avoided packaged fruit and veg more conscientiously than previously. Although I did already buy loose fruit and veg most of the time, just choosing not to buy some packaged items probably results in around 3 items less of plastic fruit and veg packaging per week – 150 over the year. Since the prices vary I haven’t worked out if any saving – generally loose veg is cheaper but bizarrely it is sometimes more expensive. 7. Cut down the frequency with which I use shampoo from every 2 days to once a week (washing with water in between), with the intention of transitioning to a “no poo” (no shampoo) routine as described here.No poo information This has the added benefit of saving water and electricity as showering is quicker without the shampoo, and less styling product as I only use it after the shampoo. Since son had his hair cut very short he has gone straight to a water only routine for haircare. Shampoo always lasted me ages anyway so perhaps I used less than most but at a guess this will save around 4 plastic shampoo bottles each year plus the same again of conditioner. In the longer term I expect to cut out other hair care products too. Approx financial saving of £15-£20, and potentially a saving on our water and electricity bill too. 8. Used my own containers a few times so far for buying cakes, and once for sausages and chosen unpackaged alternatives where possible. This is difficult to quantify but even if I only manage this once a week it would save 50 items of packaging. 10. Reduced our use of kitchen towel and cling film/foil – replacing with washable cloths and abeego beeswax wraps/ existing plastic boxes/reusing other packaging. Estimated reduction, not giving these up totally, of 12 kitchen rolls and 2 rolls of clingfilm/foil. 11. Committed to not buying any new clothes (even second hand or swapped) until at least Christmas. This hasn’t saved anything from landfill since I would give my unwanted clothes to charity or sell or give away, but it has definitely saved money. 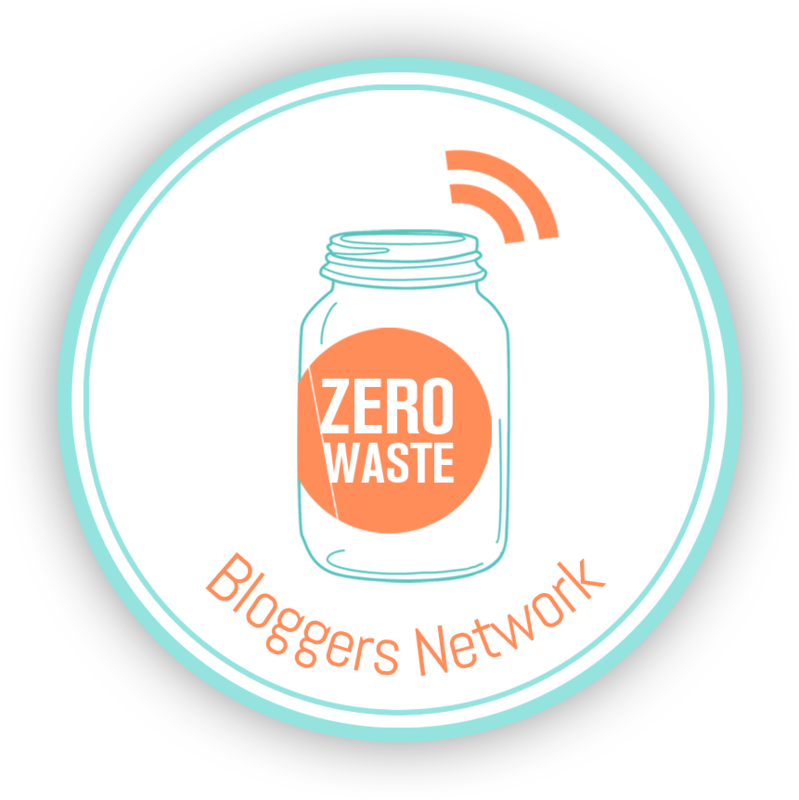 My personal credit card bill has only had 4 items on it apart from my train fare to work since Sept, and those 4 items have all been to do with reducing waste (abeego wraps, reusable coffee cups, a Lush deodorant bar and a book for the Sustainable Book Club). My average bill has dropped by £250 per month over the last 3 months, due to a combination of not buying any clothes/shoes and just by being in the mindset of not getting other stuff I don’t need. Whilst I don’t expect to sustain that level of savings, an average saving of £100 per month is reasonable, even if I reintroduce more occasional clothes buying after a few months. £1200 if sustained over a year. 12. Switched to soap nuts for clothes washing. The size bag I bought should last over 300 washes compared to around 20 for the laundry detergent I was buying before. At an average of 5 washes per week this should last me all year. The soap nuts did come in a plastic bag, but just one compared to 13 boxes or bottles (varied which one I used) of my previous detergent. The soapnuts are compostable when they have been used, and can be poured on the garden to deter slugs. In terms of cost the detergent I bought before varied from £2-£5. Over the year the soap nuts should save around £25. 13. Only used a flannel and water for facewashing. I was doing this a lot of the time anyway but switching to this full time will save around 15 packs of cleansing wipes per year, and around £30. 14. Tried using a cloth handkerchief – since I only own one at the moment ( thanks to a friend who gave me it as a gift probably around 20 years ago and I had kept it in a drawer unused till now) I haven’t yet saved many tissues, but have hankies on the Christmas list! 15. Purchased a machine washable washing up sponge. 16. Buy our eggs direct from the farm and return the boxes for them to use again. Approx 50 boxes per year, and as they are also cheaper around £20 saving. 18. Replaced frozen chips with fresh ones made form a sweet potato (as quicker to cook than regular potatoes). We don’t eat chips all the time so maybe 6 packs per year. 19. Replaced shaving gel with coconut oil in a glass jar. Plus a variety of other assorted plastic and paper packaging. These changes should also save us around £1500 which is an added bonus. We also made around £200 selling items we no longer needed on ebay. And we still have way too much in our bin! Reducing my waste a little at a time – the temptation of clothes shopping. Back in early September I decided I was not going to buy any clothes, either new or secondhand, until at least Christmas. 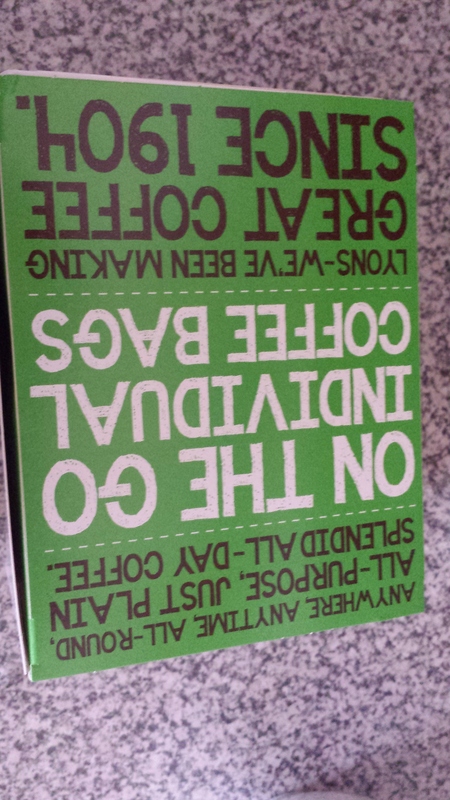 This is in a bid to reduce waste, and declutter my life a little. So far so good. If you just stay away from the shops (including the online ones) it’s easy. I even managed to go into our local Oxfam with donations several times without my usual trick of looking at the stock and coming out with something else while I was there. The test came on Tuesday when I when my aunt kindly drove me to a job interview which happened to be near a big shopping centre, to combine the car journey with her shopping trip. I was determined not to buy anything but couldn’t really avoid having a look around the shop while she was in the changing room. As it turned out I needn’t have worried. A couple of items immediately grabbed my attention, that were apparently new styles for Next’s autumn/winter collection. I have seen them both somewhere before – already in my wardrobe. 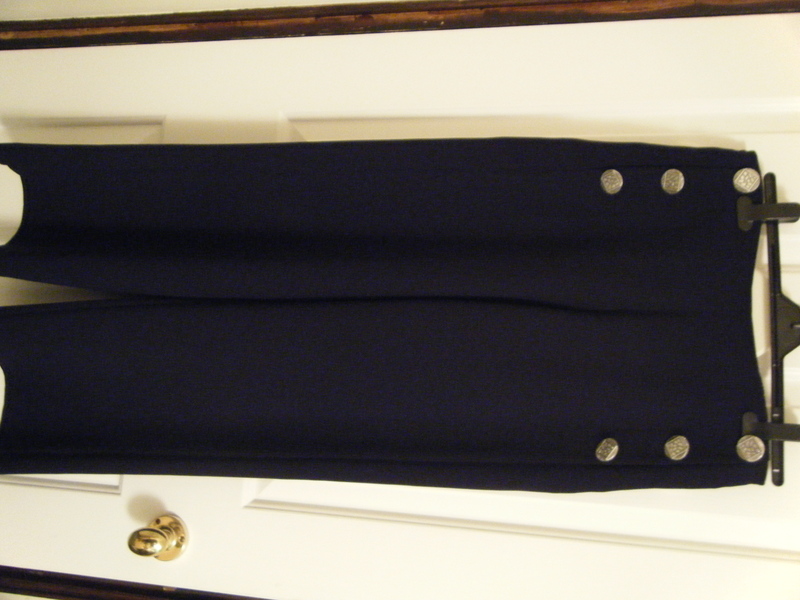 The navy wide legged trousers look really like a pair I have been wearing to work for around the last 5 years which started out as a charity shop buy which I customised with buttons from a local vintage clothing shop. 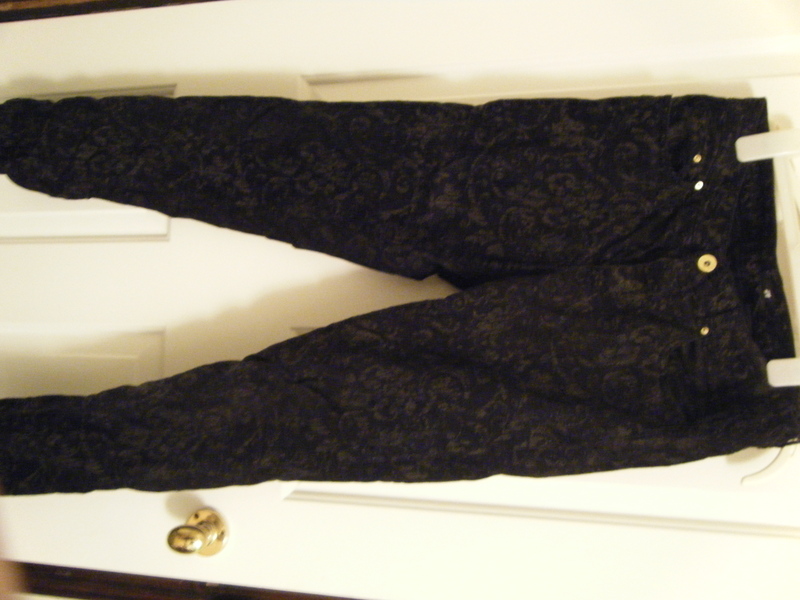 And the patterned velour leggings – so similar to some skinny patterned cords I got secondhand on ebay 2 years ago. So it turns out I don’t need anything new after all. Ahead of the trend from the charity shop. Who knew? Apart from my shoddy photos ( and the crumpled trousers I just got out the wardrobe) you have to admit they are quite similar? 10 simple ways to save energy and reduce your bills. Installing a smart meter to help you understand how you use your energy will help. Only put as much water as you need in the kettle. Don’t leave anything on standby. If your appliance doesn’t have an accessible off switch you can get a remote to turn it off. This includes turning off your WiFi overnight. Nigel’s Eco Store has a range of energy saving gadgets and remotes to make this easier. May seem obvious but switch off the lights when you leave the room. Change your lights to low energy LEDs. When choosing a new appliance go for the lowest energy option you can. Check your thermostat and timer settings to be sure you only have the heating on when needed. Turning the thermostat down a degree and wearing an extra layer makes a noticeable difference. Turn radiators off or at least to low in little used rooms. When cooking use a steamer to cook more than one thing on a single ring. We have had our solar panels for just over 6 months now. So far solar power has provided around 3/4 of our demand for electricity, and we have been exporting well over half of what we generate back to the grid for others to use. Of course it has been summer. So, how can we make the most of the energy we produce as we move into winter? The first and most obvious thing is to match up electricity use to the time the sun is out as much as you can. 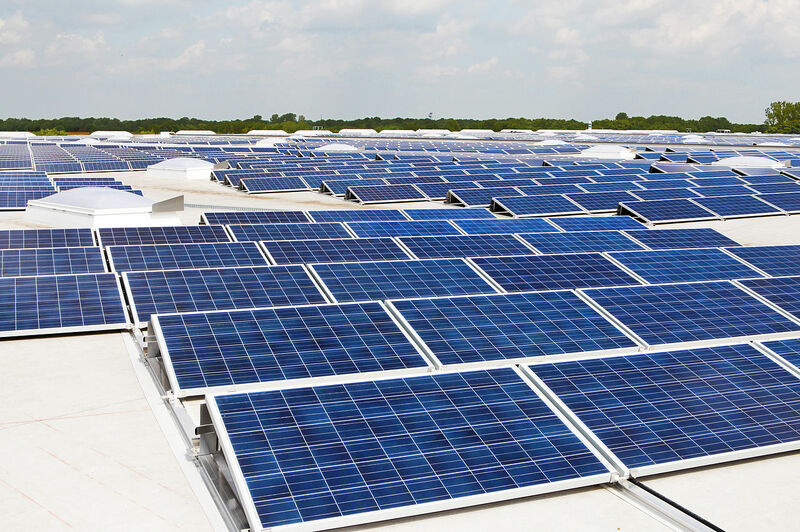 To do this best you need to start by understanding how much electricity different applicances use, and how much you can expect to generate at different times of the day which will vary according to the orientation of your panels. A monitoring device is a great way of doing this. There are several different ones out there – such as the Owl Intuition – which is cloud based and can be viewed using an app (but requires a constant internet connection), and the Wattson which provides a real time display of your generation/consumption and stores data for up to 30 days for uploading to your computer to build up a longer term analysis. We have the Wattson simply as I like to see what we are generating without needing to connect to net/turn on an app. Once you have an idea of what your energy hungry devices are, use them at the times you are generating most electricity, but not all at the same time. If you are out at work this can be done using timers, staggering when different appliances are on so they do not all reach their peak demand at once. When using the washing machine or dishwasher make sure you run full loads – putting them on half full just because it’s sunny won’t end up saving you anything as you’ll be using more water and detergent. We tend to find that starting one or other around 10am ( earlier in summer) means we are generating enough for our fairly efficient models but this will vary. This may involve a change to your routine but it is one that is worth making where you can. I noticed that one of our real power hungry devices was our electric shower, so on the days I don’t go into the office I simply take my shower later in the day, after the school run and a few other chores, when the sun has had a chance to get going. Another high energy user is the oven. If you happen to be at home during the day it is worth switching your main meal to lunchtime. Alternatively you can use a slow cooker to cook your dinner during the day – most have a fairly low consumption, although on my wish list is the Wonderbag which does most of the cooking with no power at all – you get the food to boiling on the stove, and then pop your casserole into this mega-insulated bag which keeps in the heat to cook the rest. Alternatively, if you need to eat after sunset, which we do most days, make use of the microwave – cook up bigger batches when you can during the day to freeze and then reheat when needed in the microwave which will use relatively less energy because of the faster cooking time. We also use a bread maker ( as we are trying to reduce our plastic waste) which works well on a timer – the highest consumption, as you would expect, is the bake part at the end, and when we have surplus crops an electric dehydrator to dry out foods for winter use. Use your monitor to gauge when you are generating more than you are using – the Wattson glows green at such times – and use the spare capacity for charging phones/tablets/batteries etc. When we next replace our car we might look at the electric options – although at the moment the car that gets most use is not here at the time we are generating. We are still learning so if anyone has other ideas please do comment. In time hopefully there will be affordable batteries to store the surplus energy for use in evening. Bananas – Morrisons, to be fair, had a huge display of totally unpackaged bananas, but right next to it were just as many wrapped up in plastic – why? Bananas already come in a fairly substantial skin, making them ideal for transporting to and from the shop, and wherever else you then want to take them, just as they are. I just can’t see why buying them in plastic is even an option and I really wanted to ask the other customers choosing them why. I suspect they hadn’t even considered the impact. Cucumbers – this is one of the very few green things that my son will eat, and now the small crop we managed to produce in our garden is over I am back to shopping for them. 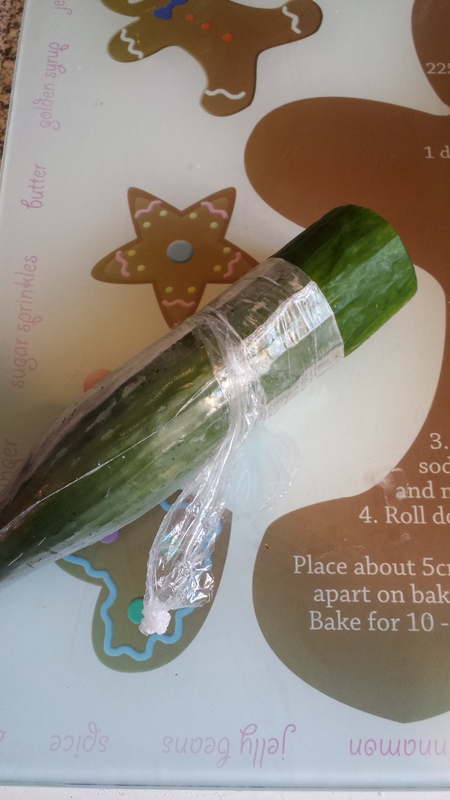 I absolutely could not find a cucumber that wasn’t wrapped in plastic either in the shops or on the market. 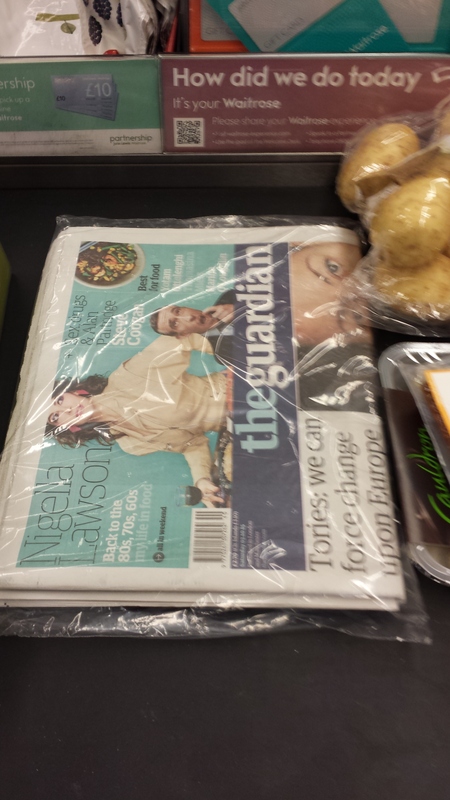 Newspaper – surely these don’t normally come in plastic? And since a quick web search about living without plastic came up with articles from the very same newspaper, shame on them. At least this one prompted a conversation with the person buying it who also felt it to be quite unnecessary. 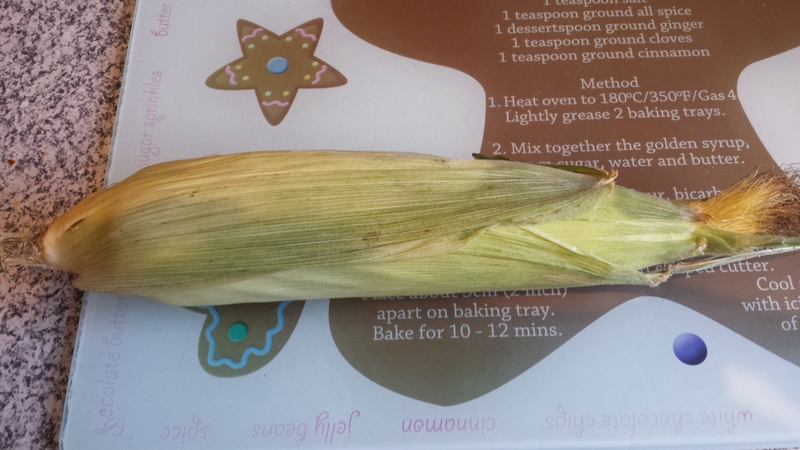 Sweetcorn – when in season these are actually a great one for getting unpackaged, but the rest of the time, hugely overpackaged. In my efforts to reduce packaging I have switched to getting much of my fruit and veg on the market where most of it is loose, but still trying to avoid plastic appears not to be the norm. Today I visited a different stall which I had noticed was more popular. I asked the stallholder to pop the veg straight into my cloth bag and offered it across the stall. “Don’t you want it in here first?” she said, holding up a plastic bag. “Er, no, actually that is why I have come to the market with a cloth bag and a shopping trolley – I don’t want any plastic.” She looked a bit puzzled. Anyway, I did manage to get my potatoes and some broccoli in the cloth bag (having declined the cucumber and green beans I really wanted but which were all sealed up in plastic and, in the case of the beans, a polystyrene tray too), but she insisted that she couldn’t weigh purple sprouting broccoli without putting that in at least a paper bag. Why? The potatoes were all muddy yet she weighed those fine so why was purple broccoli so tricky? Meat is the thing I have not really tried to get without plastic, but rather to just get less packaging by buying it from the meat counter rather than in a tray. The butcher put his hand into a plastic bag to pick up the meat then turned it inside out. I’ve no problem with that – this is just one bag and they do need to pick up the meat hygienically, and it suits me to have it in said small bag to put in freezer when I get home. But then he went to put it into another bag as well. “It will be fine in just that one bag” I said, “I don’t want a second one, I am trying to reduce plastic packaging”. “Of course,” the man said, “trying to get in good habits before the plastic bag charge comes in”. Well, actually no, and I don’t think that charge would apply in this case anyway. Then he goes ahead and still puts it in the extra bag. I obviously still need to work on that one. I had tried the butcher’s the previous week trying to buy some chicken pieces. I explained that I only wanted them in a single bag not multiple layers. Problem was, I wanted to buy free range chicken pieces. The butcher offered to cut up a whole one for me – I’ve no problem with that – and then proceeded to pick up a whole chicken sitting in a polystyrene tray in order to unwrap it, cut it up and then rewrap the pieces for me. Not quite what I had hoped for. I had a similar issue when using the milkman so the glass bottles could be reused, and as I wanted it fresh each day – fine unless you happen to want organic milk which for some reason only comes in plastic bottles and it turned out our milkman only delivers twice a week so no advantage to me over getting it from the supermarket myself.